What do hurricane Katrina victims, millionaire rappers buying vintage champagne, and Ivy League professors waiting for taxis have in common? All have claimed to be victims of racism. But these days almost no one openly defends bigoted motives, so either a lot of people are lying about their true beliefs, or a lot of people are jumping to unwarranted conclusions--or just playing the race card. 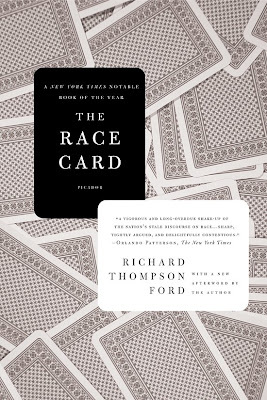 Daring, entertaining, and incisive, The Race Card brings sophisticated legal analysis, eye-popping anecdotes, and plain old common sense to this heated topic. Not the GREATEST idea in the world but I liked the simplicity of this design. I desaturated the image to make it monochromatic and relate a little bit more to the subject. An interesting thing I learned while designing this came about when I was determining the representational sizes of the cards on the cover. If I reduced the cards slightly smaller that actual size, it somehow looked wrong. I realized that if you have an object on the cover that's near to actual size and it's not, you spend too much time wondering why it looks off. So if it's near, make it actual or make it much bigger. A beautiful story of a brilliant math professor, with a peculiar problem--since a traumatic head injury, he has lived with only eighty minutes of short-term memory. She is an astute young housekeeper with a ten-year-old son who is hired to care for him. And between them a strange, beautiful relationship blossoms. Though the professor can hold new memories for only eighty minutes, his mind is still alive with elegant equations from the past; and through him, the numbers, in all of their articulate order, reveal a sheltering and poetic world to both the housekeeper and her son. 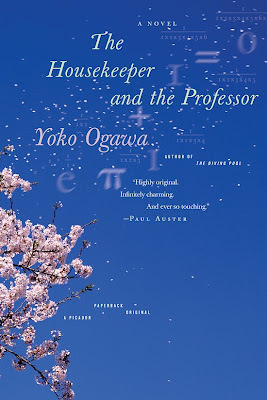 The Housekeeper and the Professor is an enchanting story about what it means to live in the present, and about the curious equations that can create a family where one before did not exist. The professors sees and speaks of the world around him in terms of math. I thought of a cherry blossom tree scattering its many petals in the wind. How the professor would see that pattern as a complex math equation and how the housekeeper could connect and begin to see the world in his terms. Along the edges where the pink background meets the photo, I printed the ∏ / Pi equation taken out to 200 decimal places to echo the meeting of the analytical and the emotional. Nature, meet Math. Math, this is Nature. Click to hear the ∏ / Pi song. 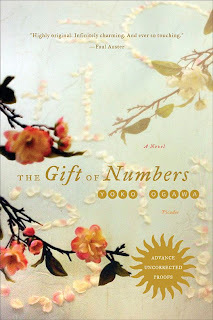 This is the second book I've designed for Yoko Ogawa. Her previous title was The Diving Pool. I remember picking this particular cherry blossom image with the dominant blue sky because I thought it would be nice to tie in with the overall blue of the pool. I think I'll have to find a way to use blue on her next novel. Way back in January 22, 2009, Deb Wood and I had the honor of judging the AAUP / The Association of American University Presses Book, Jacket, & Journal Show, 2009. The results are in! Congratulations to all who entered. One of my favorite blogs, Faceout Books was kind enough to ask us for the INSIDE SCOOP behind the judging process. Enjoy the ramblings of a mad man. I talked with Henry Sene Yee and Deb Wood to see if we could get the inside scoop on the judging process for the AAUP. They were kind enough to share with us some of what went on. Designer Scott Levine at Cornell University Press recommended me to be one of two judges at this year's AAUP design competition. They were kind enough to offer to pay for my expenses to get to the place of judging. Sounds great. A little traveling would be nice. It turns out that their headquarters are here in NYC. 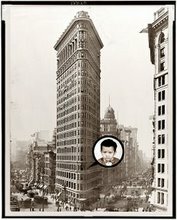 Just down the block from the Flatiron where I work. I should've at least taken a cab half a block to my deli. Scheduled to meet at 9 AM. We were set up in the quiet AAUP's office. One room had tables piled with books waiting to be judged for their interiors. There were so many interesting titles that I wanted to read. We asked what becomes of them after the judging and were told that they get donated to libraries and senior citizen homes. The jackets and covers were set up in the mail / supply room next door, spread out on the table. Deb Wood, the Design Director of Princeton Architectural Press was the other co-judge for the covers. I've never met Deb Wood although I've always admired her work at Princeton Architectural Press (PAP), no association with Princeton University Press (PUP). Ironically, we had both judged the NY Book show a month before but she was at the next table judging a different category. We had our coffee and we started going through the piles. Roughly separating them into NAYs and MAYBEs. There were surprising amounts of thoughtful and challenging solutions. A few designers names kept popping up with consistently good designs. We were pretty much in agreement on what we thought was a design that worked well. I was looking for good typography, clean information hierarchy, a fresh approach to the subject genres, interesting image choices. A photographer took pictures of us as we were deliberating. We tried to look thoughtful yet not Muppet-like in our expressions. We had a rough cut of about 45 chosen entries and needed to break it down to 35. But it was lunch time and we needed a break ourselves. We all went down the block to Monster Sushi. The restaurant is decorated with Godzilla memorabilia. They make a deliciously juicy yellow tail special roll. When they first opened, they were known as Godzilla Restaurant until TOHO, the copyright holders sued them for intellectual property infringement. You can read more here. Back at the judging circle we continued our edits. With a more critical eye, we took some out. Reevaluated. Replaced jackets. One or two became less of a YAY after several viewing while others in the MAYBEs that insistently made it's presence known were added to the YAYs. Exhausting. We then were asked to write our judge's comments. After the first one, we knew we were going to run out of adjectives and perhaps fall into the trap of saying the same boring comments. Nice blah, blah blah. Good use of blah, blah, blah. Who's really going to read this? So Deb and I decided to be a little bit loose and personal with our observations. Praising the use of hang quotes, colors, interaction between type and image. Throwing in puns and alliterations. That was fun and helped bring our energy level back up. In between pauses, we were checking our work emails on our iPhones. Getting coffee and updating my Facebook page. I tried convincing Deb to join Facebook. We were done by 4:00. Complete. Finito. Whew. 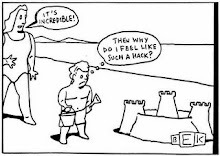 But the interior judging was still hacking away. The piles were still high. They were going to have to come back tomorrow to continue. The AAUP wanted us all to meet up afterwards for drinks at the Algonquin hotel but I was beat. I was anxious to get back to work and finish up some projects for that day. Later on I had dinner and drinks and when I got home, I saw a Facebook friend request from Deb Wood. Hello new friend. I often feel strange about judging a book cover without knowing the whole back story. As someone who's daily life consists of solving issues related to book design, I'm well aware that there is much more than meets the eye when we see an unresolved design or a missed opportunity. 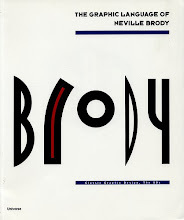 There are so many voices and challenges that the designer faces when designing a book cover. Sometimes what appears as a lukewarm cover, could actually be a triumph over many adversaries. Charles Duelfer is one of the most senior intelligence officers with on the ground experience to have worked in Iraq, before, during and after the Gulf War. He was asked by President Bush to investigate and report on why there were no weapons of mass destruction in Iraq, and his report was the first to provide official confirmation of the absence of WMD and an account for why so many people had believed they existed. (To see how the report was received – it was front page news – see Dana Priest’s Washington Post verdict) Duelfer was also entrusted with supervising the interrogation of Saddam Hussein after his capture. He has been at the heart of US intelligence’s dealing with Iraq since 1993, and he reported personally to George Tenet. 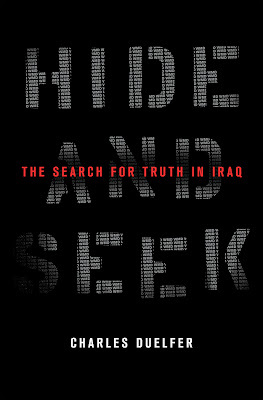 This book is nothing less that the search for truth amid the many deceptions in Iraq, the story of how Iraq was assessed as a threat, how Saddam responded fatefully to US demands, and how the decisions to topple the Saddam regime were implemented. No one is better able to see inside the mindsets of two administrations – the US and Iraqi – with their mismatched priorities, wounded pride and dangerous ability to bluff and counterbluff. We searched high and low for Weapons of Mass Destruction (WMD) and never found them. To depict a bomb or anything concrete on the cover that suggested what they were looking for would contradict the book. I thought a good approach was to make it all type and have the title created by the idea of what they were looking for. Obsessively blinded by their search, WMD is always right in front of their eyes and they see it when it doesn't exist. I gave it a stenciled / spray paint look to suggest the military. This one looked a little too, Five Hundred Twenty-Five Thousand, Six Hundred WMD-ish.